Often on our return from archaeological sites in eastern Crete, we stop in the city of Neapoli to enjoy a cold frappe at one of the little cafes around the city square. On this occasion, we decide to drive out to the excavation of Dreros (now called Driros), just a few kilometers outside Neapoli. The narrow country road takes us through a valley green with olive groves and gardens. We turn off onto an even smaller road that climbs Chorais hill, and finally stops next to a fence with a gate to a path leading up. 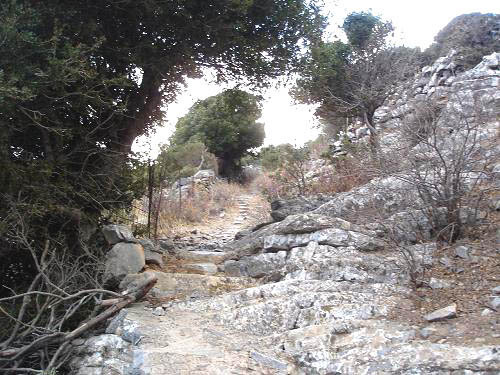 We lace our hiking boots and begin the ascent on a rocky trail. This has a familiar feel; it is very much like the roads into other Dorian towns. On our left, the path edge offers a very dangerous (possibly fatal) tumble down a rocky hillside. On our right are strong stone walls, from which defenders could force attackers over the side. 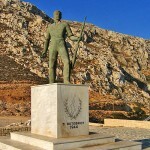 The Dorians were an aggressive people from northern Greece, who invaded Crete. They were – in turn – harassed by sea raiders during the centuries of chaos that saw the fall of great empires; so they were obsessed with security and order. 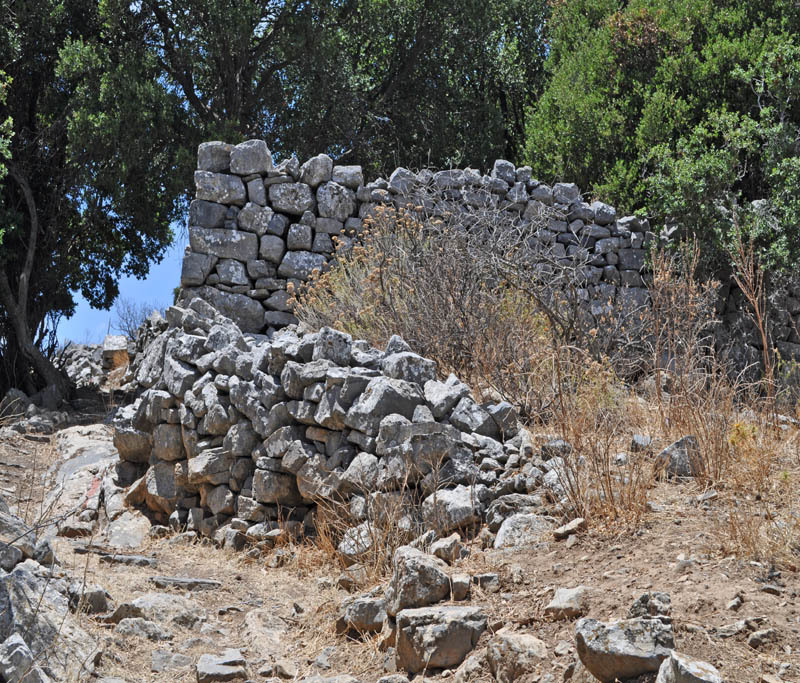 As at Lato, Vrokastro, and Karfi (“The Nail”), the Dorians built their fortress town of Dreros on a rocky and easily defended hill. 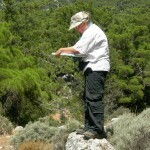 We arrive at a large open area located between two hill peaks and surrounded by oak trees. This appears to be the city agora (marketplace and community center). There are a few ruined buildings around the periphery, as well as huge heaps cut stone that appear to be the remains of many collapsed structures. 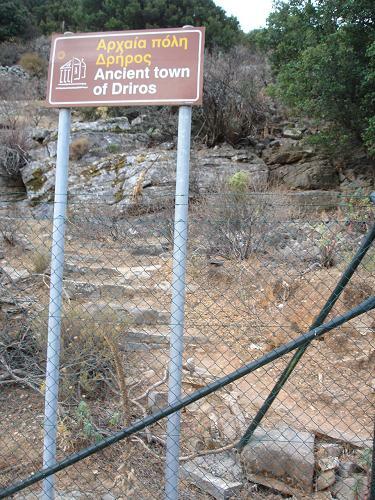 Unlike some ancient towns, Dreros has not been reconstructed. 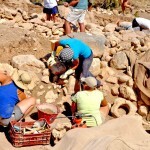 In fact, the excavation is not yet complete. We find several open trenches covered with a heavy green fabric (to protect whatever artifacts lie below) and then partially refilled with dirt and rubble. On one side of the agora is one of the earliest Greek temples, which dates from the Geometric period (around 750 BCE). It was dedicated to Apollo Delphinios (the god Apollo transformed into a dolphin to protect sailors). 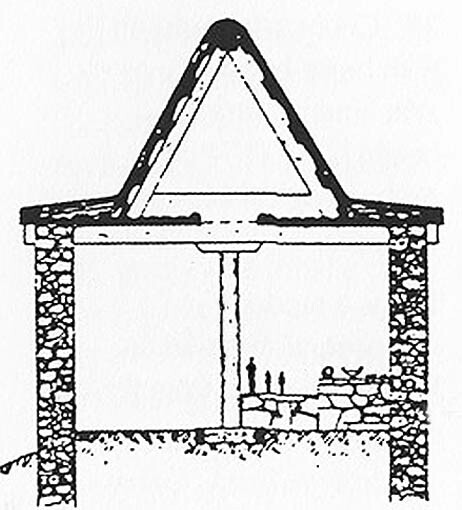 What we see is not the temple itself, but a shelter built by archaeologists to protect the remains of this very unique and valuable structure. 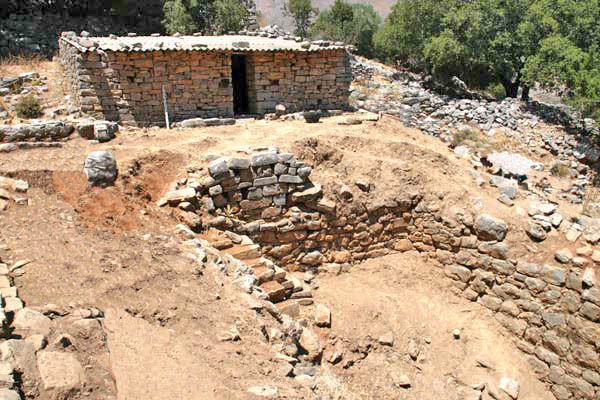 In front of the temple is a large communal cistern, which was the town’s main water supply. The temple itself is rather small, and very different from columned Greek temples of later periods (such as the Parthenon). Inside was a small altar, where three bronze statuettes were placed as devotional objects. 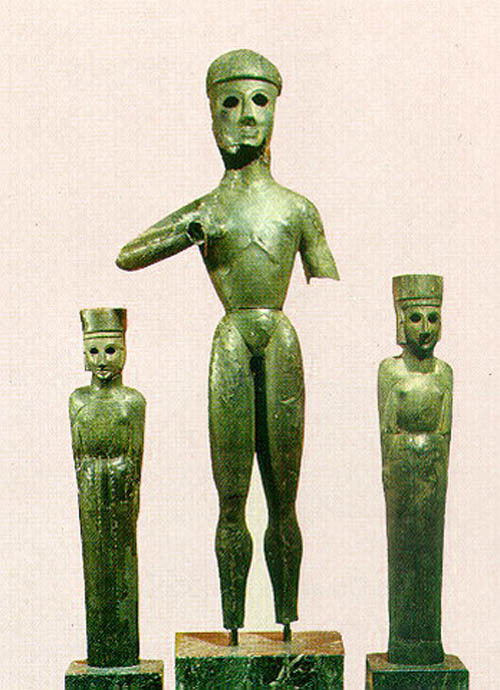 Discovered in the 1930s, these now-famous statuettes (created around the 7th century BCE) are thought to depict Apollo, Artemis, and their mother Leto. The statuettes were made of bronze sheets hammered over molding cores. The first of their kind (that anyone knows of), they mark a technical milestone in the history of Greek art – the first time anyone used bronze in sculpture. 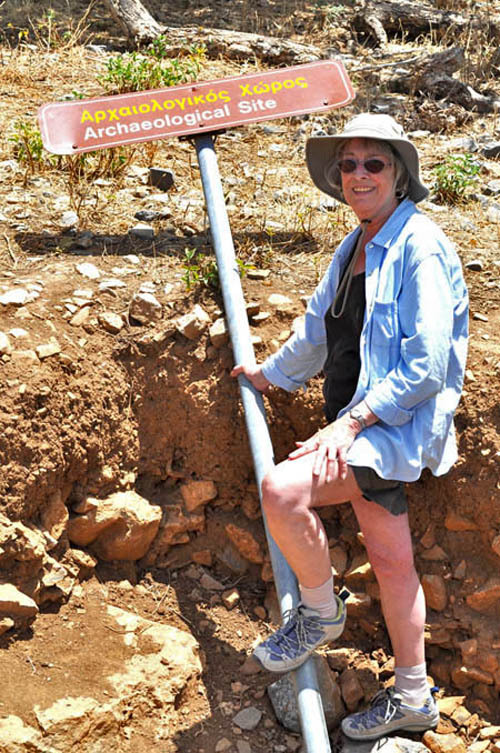 Other important finds from this excavation are many inscriptions from the geometric and archaic periods, when Dreros was at its height. One of those inscriptions is “the sacred law of Dreros,” the oldest written law ever found. It was posted at the agora for all citizens to see. In later years, this was how all Greek cities composed their legislation and established their constitution. The Dreros inscription is the most ancient example of this, and suggests the Dorians were innovators in legislation as well as art. 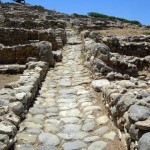 We leave the agora and continue hiking up the hill, passing fortification walls and ruined buildings of different types. 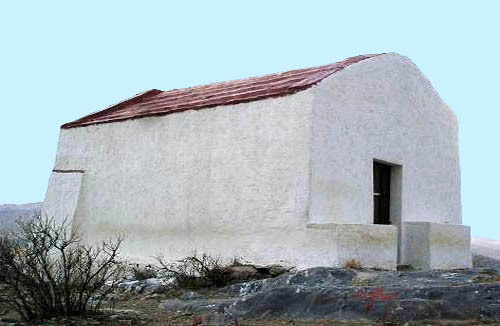 On the bare and rocky summit of Chorais hill is the small barrel-vaulted chapel of Ayios Antonios. This remote location seems appropriate, since Antonios was a religious hermit. In another way it is ironic, because this hill was the home of people who established community guidelines and legislation that allowed people to live together under laws that applied to everyone.